The best way to find the replacement parts you need for your drill is to know your model number. If you still have the original owner’s manual, you can quickly find it there. If not, you’ll have to find the number on your drill. You should see an information plate--either on your drill’s name plate or the reverse side. Here you’ll find the model number and also the type number and serial number, if they’re included. Note all these numbers as sometimes the type or serial are important in finding the exact parts for your tool. Once you’ve found your model number, you can enter it in the search box above to bring up the parts for your drill. If you’re still having trouble, give us a call and we’ll happily help you find the information you need. Repairing your drill doesn’t have to turn into a hassle. Whether you need to replace the aperture or something simple such as replacing a cover, you don’t have to walk into your repair blind. We have plenty of repair resources to help make even the toughest repairs a breeze. You can head by the Repair Center where we have hundreds of step-by-step, how-to articles that will guide you through every process of your repair. We have dozens on drills alone, covering everything from the easiest to most complicated projects. If you don’t find the solution you need in the Repair Center, drop into our Repair Forum, where a community of experts is standing by to answer any questions you may have about snags in your repair. A drill that breaks down in the middle of your repair can really derail things. You can take it into a repair shop, but shops can take days to finish a repair and charge a premium rate. It’s always better to just take care of your drill repair yourself, in the comfort of your own home. And because all our in-stock parts ship within 24 hours, you’ll spend less time waiting, and more time working on the projects you have to get done. With eReplacementParts.com, you can avoid the cost and hassles that come from a repair shop and do the job right. We can also help you get special order parts if you don’t see what you need on our site, and we can arrange for drop shipments as well. Just give us a call and we’ll do everything we can do help you get the parts you need. 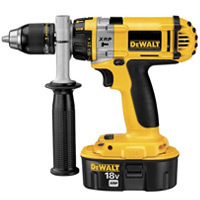 Just about everyone has a drill of some kind in their home. This versatile tool is used in most crafting professions, and is the first tool many people buy. The earliest drills actually existed about 35,000 years ago--primitive hand-spun versions that were little more than a sharpened piece of stone or metal. Since then, the tool has come a long way. The first electric drill was patented in 1895, and in 1917 Black and Decker patented the pistol-grip model we’re all familiar with today.